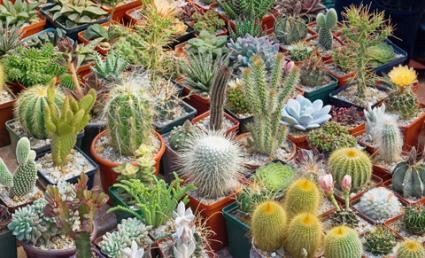 If your green thumb isn't as green as you'd like it to be, consider raising cacti and succulents. These plants are among the most forgiving in horticulture, and their variety will astound you. Although you'll hear these two names used to describe the plants in this category, technically they are all succulents, and cacti are just a subcategory in the succulent family. Cacti are distinguished from other succulents by their aureole, an area that resembles a tuft of cotton from which the spines and blossoms emerge. The main feature of all succulents is their ability to store water, which enables them to survive in climates that would burn up other types of plants. While most plants need to draw in moisture regularly through their elaborate root systems, cacti and succulents have small root systems and store moisture directly inside themselves. Therefore, they don't need to be watered as often and can withstand droughts quite easily. Plants: Learn about hens and chicks and kalanchoes or how to grow aloe vera, among other informative plant and growing articles. Garden planning: Designing a rock garden is a great idea in dry, sunny areas, and cacti and succulents will add splashes of color and interest. You can also create a succulent garden plan that is low maintenance and beautiful using a variety of design techniques and tips. Drought tolerant gardening: When you're looking for drought resistant plants, cacti and succulents make excellent options. With so many varieties of cacti and other succulents to choose from, there's bound to be a few of these amazing plants that appeal to you. Some will go great in your garden, while others may be more suitable for your windowsill. Explore this category, and learn everything you need to know to raise them successfully.